The exploding cigar plot to assassinate Fidel Castro is well known - but what about the other reported 637 plots against his life? The CIA and US-based Cuban exiles spent nearly half a century conspiring to do away with a leader whose country had the same effect on the US as "the full moon has on werewolves", according to former US Havana diplomat Wayne Smith. The Cuban leader himself once remarked: "If surviving assassination attempts were an Olympic event, I would win the gold medal." The plan was to pack a particularly spectacular one full of explosives to attract Castro, a keen diver, and to detonate it when he picked it up. Decades earlier in 1975, the US Senate Church Commission revealed details of at least eight plots on Castro's life, using devices which, the commission report said, "strain the imagination". One plot using underworld figures twice progressed to the point of sending poison pills to Cuba and dispatching teams to "do the deed", it said. At almost the exact moment that President Kennedy - who had authorised the failed Bay of Pigs invasion to overthrow Castro in 1961 - was assassinated, a CIA operative was apparently handing a poison pen equipped with a very fine needle to a Cuban agent. The agent however was disappointed and asked for something "more sophisticated", the report said. One of Castro's former lovers, Marita Lorenz, was also recruited. She was given poison pills to put in Castro's drink. But Castro found out about the attempt and is said to have handed her his gun to use instead. "You can't kill me. Nobody can kill me," he said, Ms Lorenz told the New York Daily News. "And he kind of smiled and chewed on his cigar. I felt deflated. He was so sure of me. He just grabbed me. We made love." The most recent known attempt on Castro's life was in 2000, when a plan was hatched to put a large quantity of explosives under a podium he was due to speak on in Panama. The plot was foiled by Castro's security team. 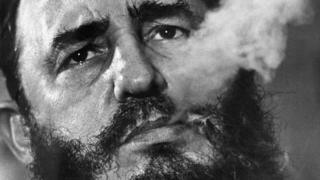 There were also plots to make Castro, also known as "The Beard", an object of ridicule rather than kill him. One was to sprinkle thallium salt on Castro's shoes during an overseas trip in the hope that his famous beard would fall out. But it was foiled when Castro cancelled the visit. Castro took myriad precautions to evade would-be assassins. But in 1979 as he flew to New York to address the UN he could not resist a bit of grandstanding. "I have a moral vest," he said.